For the last few weeks I am hooked to the YouTube videos of the four wild guys of Sorted. The amount of ‘crazy’ they bring into their kitchen is surely entertaining. They monkey around and use shortcuts to cook food. Their recipes are easy and seem pretty quick. But I have often wondered, do their recipes work? This is basically Thomas Keller’s recipe of Ratatouille with some tweaks by Sorted. I edited the recipe further based on what ingredients I could find and what I couldn’t. 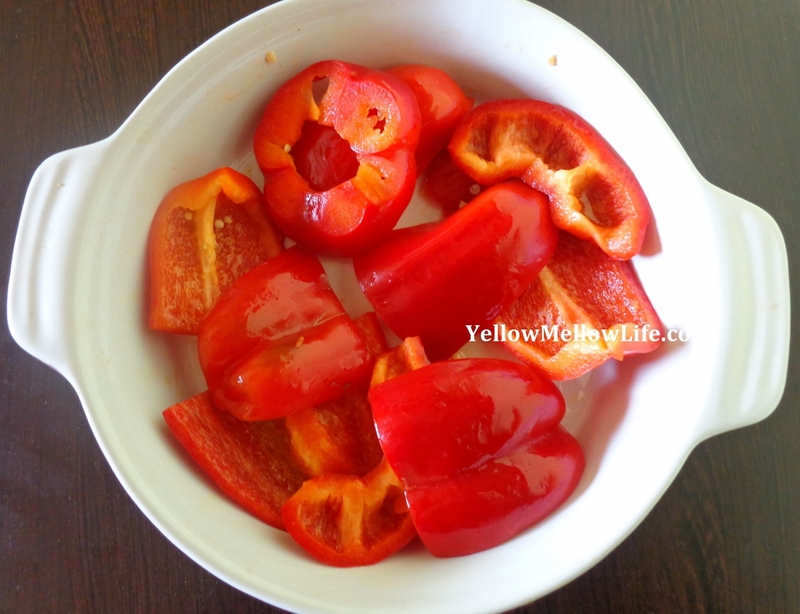 De-seed and cut the red bell peppers into big pieces. 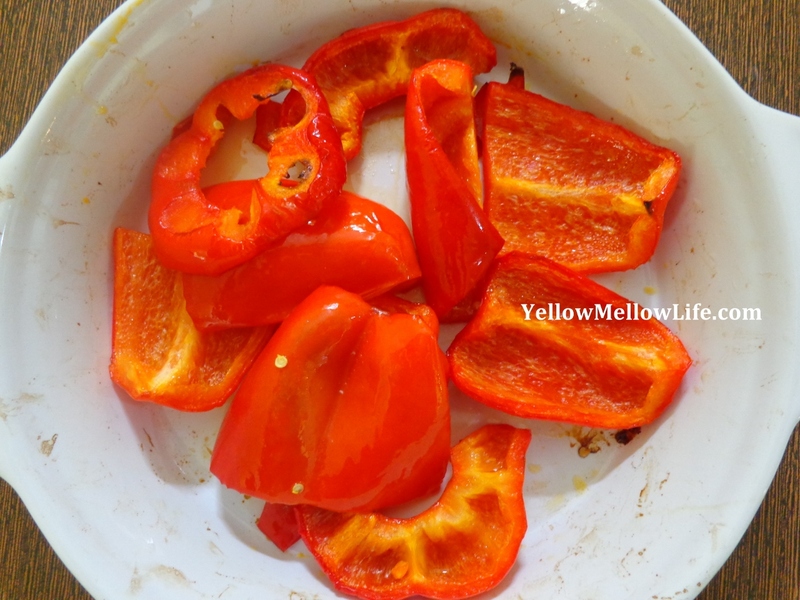 I cut each bell pepper into 5-6 pieces. Drizzle olive oil on them with salt and pepper to taste. Mix well. Let them cook in the oven for 25 minutes. They will look soft and a little charred around the edges. Roughly chop the garlic and the tomatoes. Heat up about a 2 tablespoon of olive oil in a pan over medium heat. Add in garlic and saffron. And then immediately add in the chopped tomatoes. Also add in salt and pepper to taste. Add in 1/2 cup of water and let the sauce come to a simmer. Once that happens, cover the sauce and let it simmer for 10 minutes. 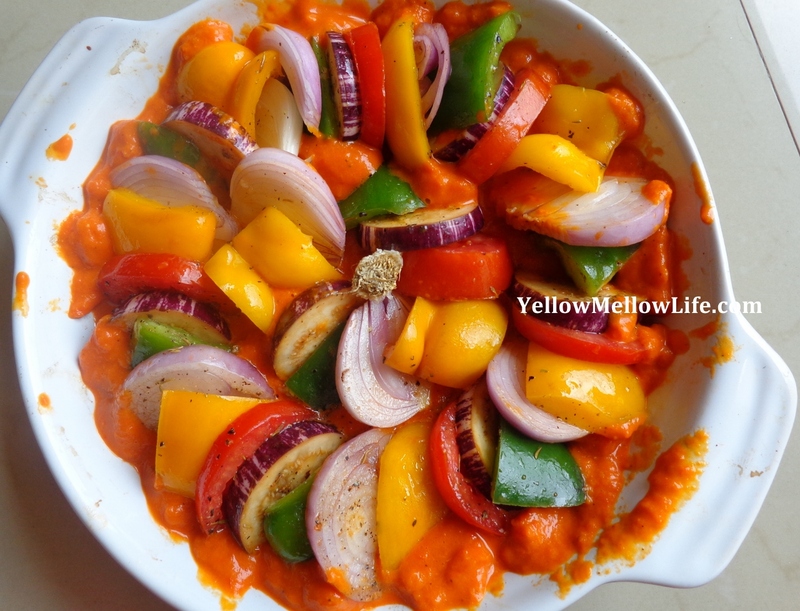 The tomatoes will soften, the water will get incorporated and the saffron will get the whole sauce an amazing orange color. 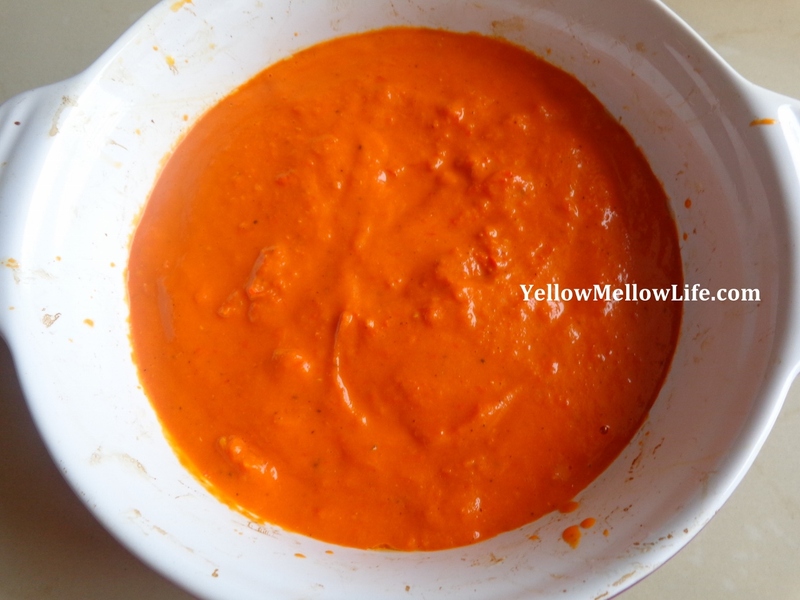 Add in this tomato sauce and roasted bell peppers in a blender and blend into a smooth sauce. 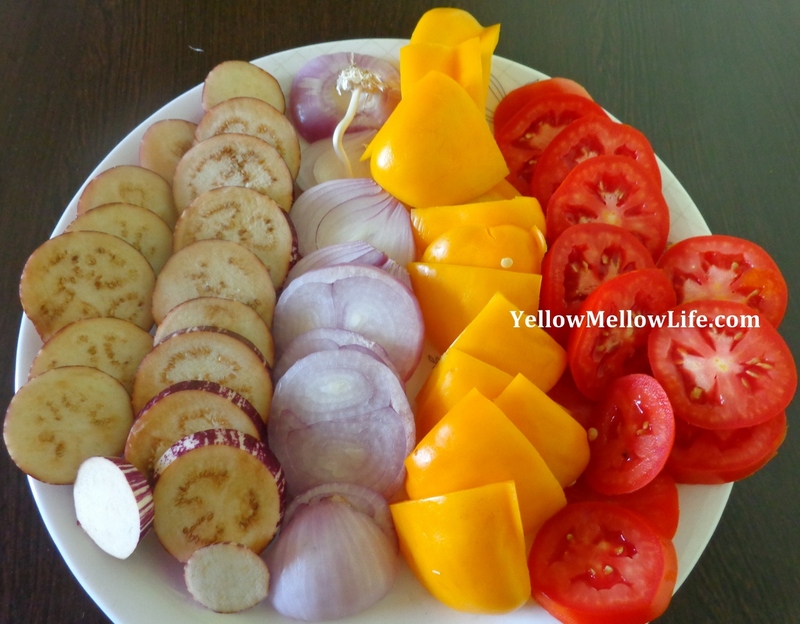 Slice up the eggplants, onion and tomatoes into slices with each being about 1 cm thick. 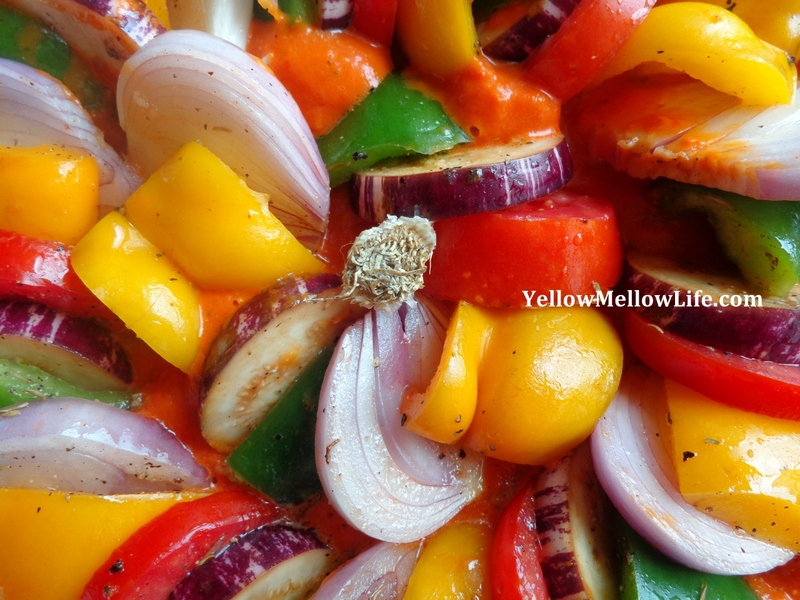 Cut yellow and green bell peppers into pieces approximately the same size as the size of other vegetables. Dump all sliced vegetables in a big bowl. Add in finely chopped garlic, thyme, olive oil, salt and pepper. Toss and coat all vegetables gently. Ladle the sauce on the bottom of a baking dish. We do not want excess of sauce, so just add about 3/4 cup of sauce for now. Arrange all sliced vegetables in an overlapping pattern. Keep adding and fill up the dish. You basically want enough sauce so that your vegetables are dipped up to half. So if you feel that the sauce that you added earlier wasn’t enough, add more around the edges. Drizzle grape vinegar and some more olive oil on the dish. 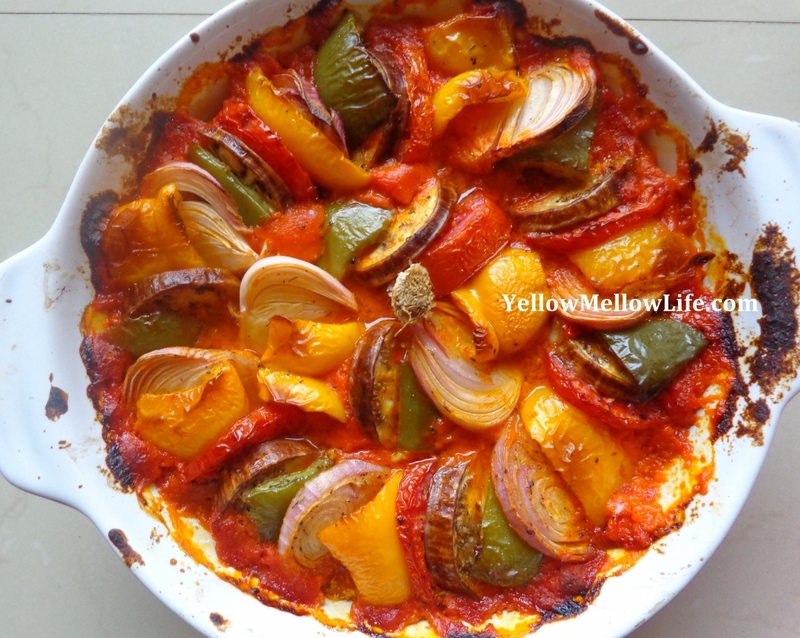 Let the ratatouille bake at 160 degrees Celsius for 30 minutes. After that increase the temperature of oven to 200 degrees Celsius and bake it again for another 30 minutes. Take out of the oven and let it cool for 10 minutes. Dig in! I should mention that I had some sauce and about a handful of raw sliced vegetables left from the dish. I froze the sauce and vegetables separately and used them a couple of days later for another serving of ratatouille. 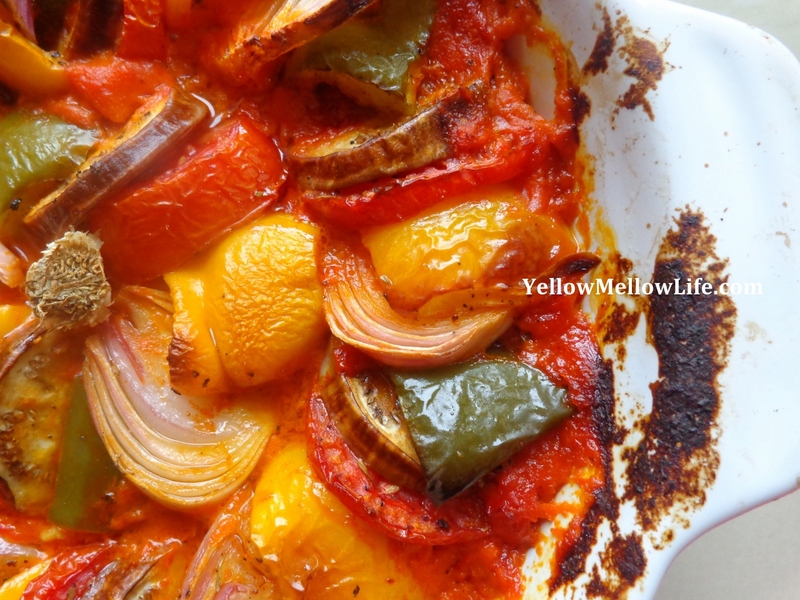 My verdict on Sorted’s Ratatouille recipe? The dish Ratatouille sounds so French and you might feel it is one of those things that you can eat only at a restaurant. But Sorted’s recipe made cooking the dish so easy that it was unbelievable. Thank you Sorted, you’ve got a fan for life! Next story Starstruck! Happy! Motivated!